Dark social is the sharing activity that is somewhat invisible to traditional analytics. It’s the culmination of referrals and sharing of content that originates from instant messages, e-mails containing links, and most recently, the rise of ephemeral social communication platforms such as Snapchat, WeChat and WhatsApp. There are a significant number of conversations -- and more importantly, potential intent -- from a marketing perspective that is simply being ignored and untapped. Currently, there’s an over-reliance on retargeting. Dark social could represent an opportunity to bring balance to the equation. 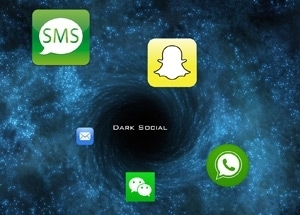 What makes cracking the code with dark social in 2015 even more paramount is the sharp rise in adoption of ephemerally charged, socially centric communication apps such as Snapchat, WhatsApp, WeChat and Kik. The convergence of social and mobile is here and the percentage of content shared through dark social will continue to rise at an exponential rate in 2015. A few pioneering brands have incorporated sharing functionality with the Facebook-owned WhatsApp, which has over 400 million users sending 50 billion messages a day. FTW, a USA Today sports site, introduced a WhatsApp sharing button to its mobile experience recently, and almost immediately saw shares from WhatsApp climb to 18% of the site’s overall sharing activity. Further, 53% of shares came from “dark social” vs. 47% through traditional social mechanisms. SnapChat, another ephemeral application, is the fastest-growing social app heading into 2015. With a user base 100 million active users, 60% of whom engage with the app 22 times per day, Snapchat represents another dark social platform that should be considered in 2015. This is especially true with the upcoming strategic partnership model that will incorporate multiple media outlets into the platform. This will convert the experience to include more content from external networks and publishing partners. And there’s Wechat, with a global audience of 600 million users, 180 million outside of China. It is the fifth most-used smartphone app worldwide. All of these essentially represent the next wave of dark social that will quickly raise dark social sharing's current percentage of 59% of total sharing even higher in 2015. 1 comment about "2015 Will See The Rise Of Dark Social ". Steve Plunkett from Cool Websites Organization, January 21, 2015 at 2:49 p.m. Dark. as in not public sharing.. private sharing.. the tools become useful for the people that use them.